BrylaneHome Outdoor Furniture Set – Perfect For The Beach! I know I told you guys we just spent a long weekend over in St. Augustine, the weather was perfect and it was family time. One of my favorite things about Spring Break, Summer, and living in Florida is all the time we can spend at the beautiful beaches! The kids would play in the sand and surf for hours. But, us parents like to have some shade from time to time! We have tried several umbrellas and most end up blowing down the beach with moments of us getting comfortable. 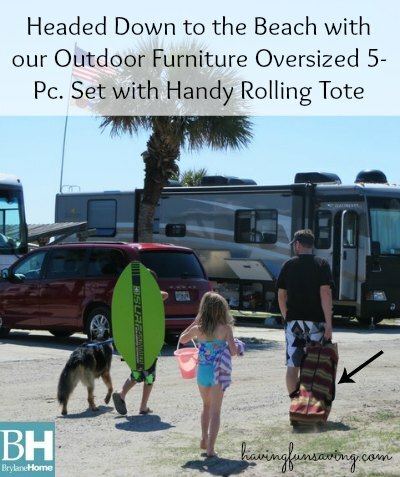 So, when my family and I got the chance to review the BrylaneHome Outdoor Furniture Oversized 5-Pc. Set – complete with a cooler, storage pockets, 2 chairs, and an umbrella we were all excited! I love that it has easy to carry handles or you can roll it! Since it has wheels, the kids can even roll it if my hands are full. The cooler is on of my favorite features…snacks and drinks are a must have when relaxing at the beach! We always carry down a bag with ice packs, but the BrylaneHome chair with built-in cooler keeps our food and drinks cool and out of the sand! Not matter what bag we bring to the beach, it always ends up getting sandy, so a cooler off the ground is absolutely perfect! The pockets are the perfect spot to hold your glasses, camera, phone, book, sunscreen, and anything else you can think of. The BrylaneHome Outdoor Furniture Oversized 5-Pc. Set was a must have for us on our St. Augustine vacation, and it will go with us each time we head to the beach from now on! I couldn’t believe ow easy it was to transport (carry or roll), that it was surprisingly light-weight, and how easy it was to set-up and take down! If you are looking for a great gift idea for Mother’s Day or Father’s Day – the BrylaneHome Outdoor Furniture Oversized 5-Pc. Set is sure to be a favorite! Plus, it’s ON SALE – yep, you can grab your day of relaxation for only $79.99 right now 🙂 That’s 42% off the regular price! Where do you get the BrylaneHome Outdoor Furniture Oversized 5-Pc. Set? Right online at BrylaneHome!